Justin is the author of the novels BRUISED, WEDNESDAY'S CHILD, and THE GULLIES (2016), as well as, several short stories published in magazines and anthologies around the world. BRUISED was mentioned in Brian Keene's "Top Ten Books of 2015". Justin also investigates the paranormal with a TAPS-family group and plays volleyball twice a week. Correspondence from his fans is encouraged. 1. What inspired you to write horror orientated books? Justin: I grew up watching horror flicks, starting with the Amityville Horror at age seven. My mom was, and is, a huge horror movie buff. Anyway, that got me into reading King, which lead to reading Laymon, Ketchum, and Keene. 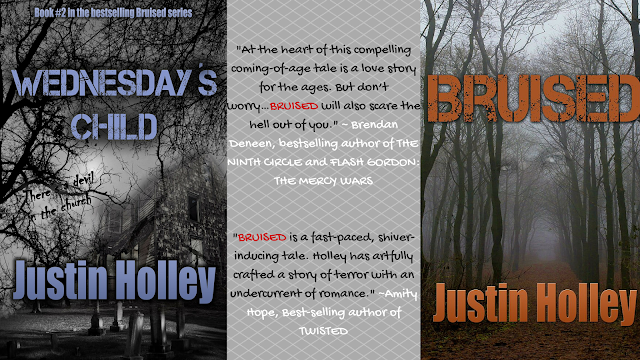 Those last three inspired me to write horror fiction…although BRUISED and WEDNESDAY’S CHILD may be more Thriller than straight up horror. Brian Keene’s, Ghoul, inspired me to write BRUISED, most definitely. 2. Who are some authors that have inspired you on your journey to become an author? Justin: I should have read through all these questions first, but please see above. Richard Laymon, Jack Ketchum, and Brian Keene really fueled my passion to write scary things. I could also list my entire writing group (who are also all published authors), but I know I would accidently forget one as I type this from memory. But they are all awesome…and I mean all of them. They call us the Goat Posse and we’re on a roll…definitely getting some attention out in the literary world! 3. What is your favourite scary movie and book? Justin: My favorite movies are, the Halloween franchise, the Alien series, House on Haunted Hill, Night of the Living Dead, and Thirteen Ghosts…among others. I absolutely LOVE a lot of books, but The Traveling Vampire Show by Richard Laymon, Offseason by Jack Ketchum, and Ghoul by Brian Keene rate right there at the top. 4. As an author, what do you enjoy the most about writing and completing a book? Justin: You know, it’s hard to beat the feeling of accomplishment derived from finishing a quality product. During the writing process, I’m so focused that I rarely take the time to reflect on how good it feels to just write. It’s afterwards that I can sip a drink and think back on the process and enjoy it. But then, shortly thereafter, come revisions and the like. So, the period of reflection is always way too short. Watching as the reviews come in is also fun, getting to see what others enjoy, or don’t enjoy, about the story. BRUISED was recently mentioned on Brian Keene’s “Top Ten Books of 2015”…so, of course, it also feels good to be recognized by my literary heroes who are now, amazingly, also my peers. I’m still not used to that! 5. Between Bruised and Wednesday’s Child, which was more difficult to write? Also which POV was the most fun? 6. In one sentence how would you describe the Bruised series? Justin: That’s a tough one…even tougher than query letters and back-page copy. Well, let’s go with this: Come join Tracey and Jason as they follow their life-long journey of lost innocence and paranormal discovery. 7. What is one quote that has stuck with you and inspired you throughout your life? 8. What is one of your favourite quotes from your own writing? 9. What would you say is the most fun way to promote a new book coming out? Justin: Personally, I love book signings. Whether they are at big shindigs, conferences, or a small bookstore, I absolutely enjoy interacting face-to-face with fans and signing books. I’m more of an introvert than an extrovert, so afterwards I am exhausted, but what fun they are! 10. If you could give your past self some advice for the future to come, what would it have been? Justin: Be patient. It’ll come. But if you’re expecting instant success, you are barking up the wrong tree. Writing is a process of improvements and rejections and more improvements until, finally, you write something that, somehow, happens to not be awful and that people are interested in.